Decision making represents the core determinant of organizational success with leaders making a never-ending stream of significant and strategic decisions. Despite this reality, only a very rare few organizations a) have individuals or teams trained in decision making, b) follow any sort of evidence-based decision making process, or c) utilize purpose-built technology designed to improve the efficiency and effectiveness of group decision making. One of the best ways to bridge the gap between where we are and where we need to be is to adopt a methodology or framework specifically designed to mitigate the many barriers inherent in organizational decision making. The Decision Quality (DQ) framework is based on decades of academic research and practical application of various Decision Sciences including Behavioral Economics, Cognitive and Social Psychology, and Decision Analysis. 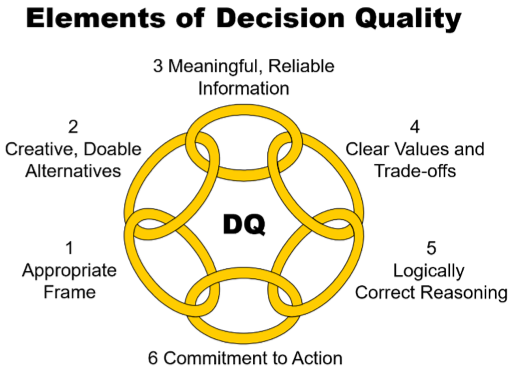 The DQ framework is comprised of six elements and provides organizations and decision facilitators with the information required to consistently lead groups to high-quality decisions; thereby realizing an unprecedented amount of value. Appropriate Frame. Ensure you are solving the right problem and everyone is on the same page about the who, when, how, and why of how the decision(s) regarding the solution will be made. Creative, Doable Alternatives. Compile a robust set of possible alternatives; each feasible and compelling. Meaningful, Reliable Information. Identifying what we need to know and isolating the signal from the noise; two formidable tasks in an fast-paced era of information overload (and misinformation). Clear Values and Trade-offs. Every decision involves trade-offs and knowing what we truly want and value is key to selecting between alternatives. Logically Correct Reasoning. Poor reasoning most often leads to poor decisions. Mitigating biases, and getting beyond both our paradigms and our comfort zone is required to make truly rational decisions. Commitment to Action. Build commitment throughout the organization to ensure we realize the full potential value by seeing the decision through execution and implementation. By adopting such a framework and committing to the people, process, and technology elements required to enable such an evidence-based approach to decision making, organizations can realize a unrivalled competitive advantage. As organizations begin to improve the quality of decisions made by specific individuals and teams, these capabilities can be refined and expanded such that the entire organization moves toward a state of Organizational Decision Quality (ODQ). As organizations continue to advance on the ODQ maturity spectrum, they eventually reach a point where DQ permeates the very culture of the organization and becomes sustainable for the long-term; able to withstand changes in leadership, market environments, and the like. Contact us if you would like to learn more about Decision Quality and how to improve the quality of decision making in your organization or the organizations you work with.